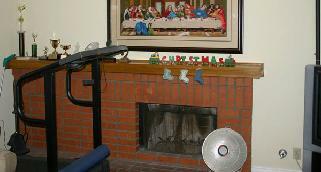 Is your fireplace stuck in the 60's or the 70's? Are you ready for a change? You can design and update your fireplace to better reflect you and your lifestyle. No matter what your fireplace looks like now...it can be transformed into something beautiful! Don't have a fireplace? Do you want one? Get one! The possibilities are endless. 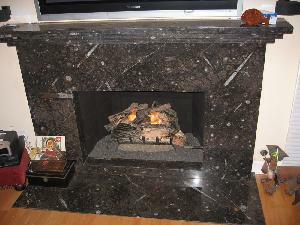 Oakland is a licensed general contractor specializing in fireplaces with over 28 years experience. Don't call just anyone! Call the experts! Oakland can do it all...and do it right! We offer free in-home estimates within Orange County. Or you can send us a picture of what you have, and give us an idea of what you want...and we can give you a rough estimate via email! If you're ready to make a change, you've came to the right place. 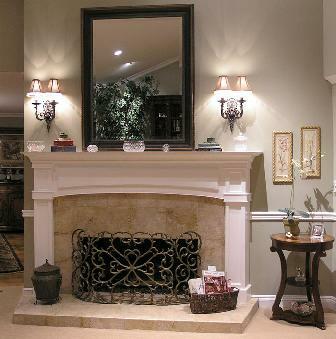 Oakland can not only help you change your fireplace, we can help you transform your home. Take a look below and imagine YOUR fireplace different! Click on the any picture below to see the full size photo. This is Kevin's mantel. Kevin chose his fireplace design with flare. 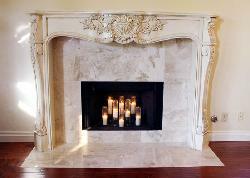 This white mantel surround together with the beauty of natural travertine transformed his space into a showcase. Conrad's brick columns dominated this wall. This was a popular style of builders in the 70's. Amazingly transformed! Conrad wanted a different look. He chose a white mantel surround and a beautiful marble that makes a wonderful contrast to the color he chose for the walls. Ron wanted a major change! 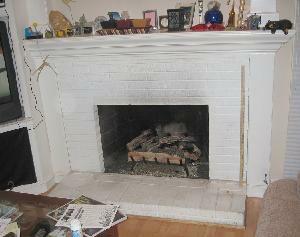 This unsymmetrical brick fireplace was an eyesore. The raised hearth took up valuable floor space. Ron knew what it wanted. And it wasn't brick! He completely changed the feel of this room by choosing a beautiful hand carved mantel that was custom stained. 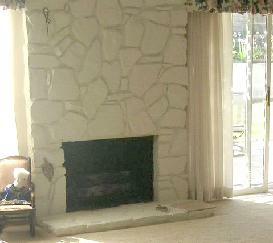 Before, Bill and Dodi had a dated fireplace. The flagstone took over this wall, and wasn't a space that was easy to decorate. 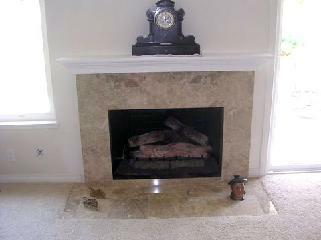 Removing the flagstone and replacing it with travertine, the fireplace was more suited for their style. This sleek white painted mantel cap topped it off, and gave Dodi a place to put her mantel clock! Pat and Shea didn't like their white painted brick fireplace. It was hard to keep clean and the cabinet in the corner held their tv, but made the space look cluttered. They needed a focal point. With their unique tastes, Pat and Shea picked out a fabulous granite slab. Oakland eliminated that corner cabinet, replaced the brick and wood surround with a custom made all-granite face and mantel and ran conduit in the wall above the fireplace to enable them to mount their plasma tv without unsightly cables running everywhere. Want some more ideas? Go to our Gallery page and see some more beautiful creations that Oakland has helped create!